The package is appropriate for those who are interested in a natural and healthy weight loss. This will help in full body tone up and fat depletion without any unnecessary pills, equipment and strenuous exercises. With Diet Clinic lose all your extra body fat and get attractive discounts with 90 day’s weight loss package. Lose weight without heavy exercises, monotonous diets, pills etc. and only homemade diets are sufficient. The package is appropriate for those who are interested in a natural and healthy weight loss. This will help in full body tone up and fat depletion without any unnecessary pills, equipment and strenuous exercises. After booking this weight loss package you have to fill our registration form at the clinic or online, the form will help us understand your physical, medical and dietary requirements. Then you meet or receive a call from a dietician from our side, to discuss your lifestyle and other relevant issues. After analyzing your lifestyle, we prepare a diet plan that suits your profile and give or send you a diet plan for the next 3 to 4 days. After a proper follow-up, you are required to give your feedback to the concerned dietician either by phone/Whats app/ SMS or by personally visiting the clinic. 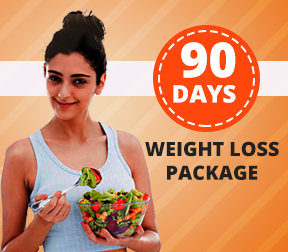 This is a 90 days program which allows you to lose 1 to 2 kilos per week depending on your metabolic rate. In this plan, you get more consultations for lesser costs as it is economical than 30 days package. The diets are meticulously prepared as per the personal specifications of the client and you can lose around 10 kilos in the span of 3 months. Discussion and modifications are done at regular intervals.